I have gushed about Superman Secret Origin with each issue. 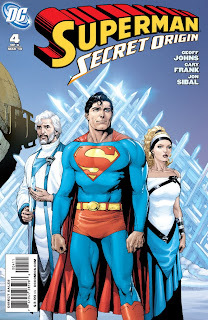 I am about to gush a bit about Superman Secret Origin #4. And when I gush I can be long-winded. Bear with me. Did this series need to happen? Did we need a revamping of Superman's beginnings? Or did all of the people reading the Superman titles have a decent enough handle of things that they could cruise along? With most everything about Byrne's Man of Steel retconned away, with Superman Birthright not cemented as dogma, I think something was needed to smooth over the rough spots. With Superman being the centerpiece of next summer's event, the timing was right for a place for new readers to refer. Still, with DC being 'all Blackest Night all the time' right now, it feels like this series is flying under the radar. I wish that DC was marketing this series more because it is absolutely delightful. Johns and Frank are really meshing here and spinning an origin story that can appeal to the newer readers and the more seasoned fans alike. This series is also making me a bit anxious for the 'Year Without Superman' to come to an end. I miss seeing the big red S.
Last issue with Superman revealing himself by rescuing Lois Lane. How would the downtrodden of Metropolis react? 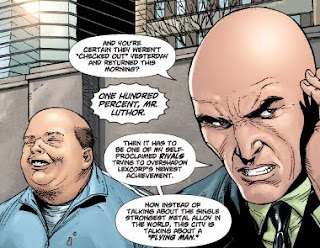 How would current city leader Lex Luthor respond? Well, he starts by continuing the practice we heard he does daily. He comes out to the throngs of needy in front of his tower and randomly picks someone to help. As I said before, this reinforces wrong thinking in the populace. One, it makes it appear that good will and success is random and that hard work has nothing to do with it. 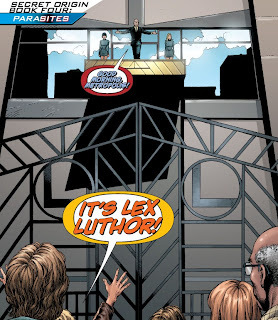 Second, it makes Luthor into the savior of the common man. What better way to convey that then this opening shot. Here is Luthor high above the crowd, arms spread in a messianic fashion. With the point of view coming from the crowd, you get the sense of how small you would feel in comparison to Lex, how far away he is from your troubles. It turns out that the person picked from the crowd may not necessarily be random. Luthor has men tucked away who are electronically picking out people and feeding their info to Luthor's ear piece. When his men see that Rudy Jones is in the crowd and a worker at the hated Daily Planet, the choice is obvious. What's more, Luthor isn't unflappable. The arrival of Superman has trumped the unveiling of his Metallo alloy as the top story in the area. Luthor can't believe a man can fly and so has his men scouring his labs to see if someone borrowed a rocket pack. The dichotomy of the scene - all this malevolence behind the trappings of 'saving someone' - really let's the reader see just who the real Luthor is. And when it turns out that no one borrowed a rocket pack, when there needs to be another answer to explain Superman, Luthor sends his men to the Planet to question Lois and Clark. Of course, Lois is thrilled. She has wanted to talk to Luthor for some time. Regardless of the circumstances, she is going. Clark seems less thrilled. Again, the art here works so well. Doesn't the absence of a background in this panel bolster that appearance of meekness in Clark. Doesn't he seem smaller? The two head to Luthor's office and get led into this spacious office. I know I tend to ruminate over art sometimes; I probably make assumptions about a writer or artist's reasoning behind a panel. But when I am affected by art, I feel that I need to express myself. First off, look at the size of that picture of Luthor, a palpable object of his pride. If we say Clark is at least 6ft, that picture has to be 30ft tall. 30ft! That is above a 15ft door! And we don't even see the ceiling! Contrast that clean space to the grimy crowded streets of Metropolis. This is another way of showing just how disconnected Luthor is from the common man. It reminded me of Tyrell's office in Blade Runner ... someone set up as a god above the throngs of people. This panel might be passed over quickly but it deserves some inspection. 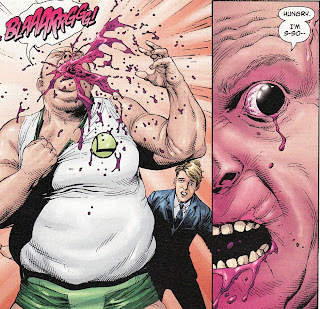 Lois comes in filled with bile and ready to lay into Luthor with both barrels. I love how quickly Lex disarms Lois by telling her that her father says hi. 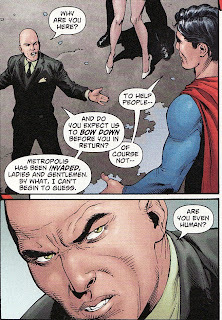 You have to respect Luthor for knowing everyone's Achilles' heel. Look at Lois' face! She is shocked and confused. Almost stammering. All that confidence she brought in is gone. And look at Clark's response; this is the first time he has seen Lois like this. He is just as shocked. Unfortunately, he eats a doughnut which has fallen into some hazardous biochemical ooze, triggering his transformation from a parasite into The Parasite. Okay, the doughnut origin was the one small piece of the book that didn't wow me. Seemed a bit silly. The Parasite begins draining and killing Luthor's workers. 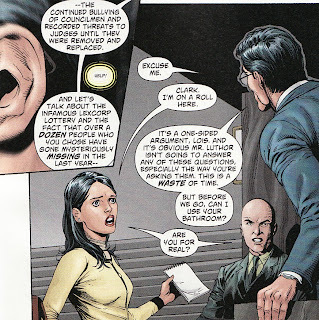 Their cries for help are heard by Clark who is witnessing a back and forth interview between Lois and Lex. I love how Clark exits so he can save people. He calls the exchange a waste of time, which is the truth. Both Lois and Lex are stunned and ask him if he is serious when he asks where the bathroom is. 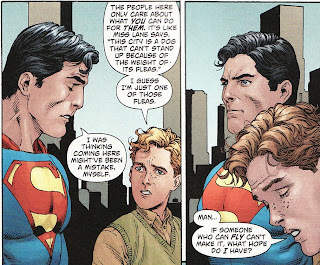 In some ways this will make Clark seem like a stronger person than the meek klutz he has been acting like. Walking out on an interview with Luthor? That would take backbone. 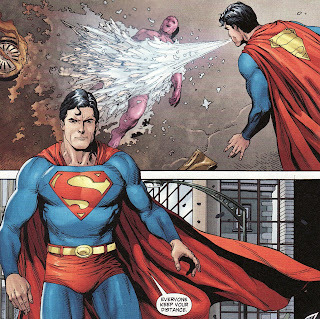 But he does leave, changing into Superman and taking on the Parasite. After initially being drained a bit, he is able to subdue Rudy with a mix of heat vision and then super breath. But the people of Metropolis are still nervous, still afraid. They don't know what to make of Superman yet. And Luthor knows how to fan the fires of fear. 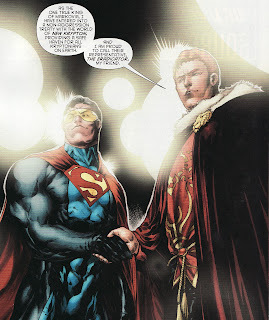 He asks if Superman wants everyone to kneel before him ... an ironic question coming from Lex. And then he asks the million dollar question ... is Superman human? 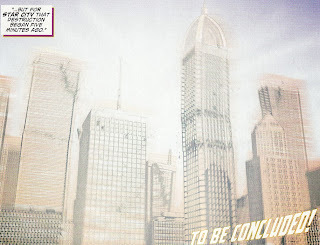 Luthor has been the city's savior in the past. The people are sure to believe him. Could Superman be an intergalactic conqueror? As with last issue's rescue, Superman leaves before facing the tough questions. He flies back to the Daily Planet and runs into Jimmy Olsen on the roof. 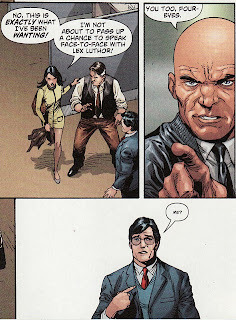 The early part of the issue shows how Luthor can't relate to the common man. Here we see how Superman can relate. Jimmy talks about how he thinks he is going to leave Metropolis because he is failing there. Superman says he thinking of leaving too. Jimmy wonders what chance he could have. But rather than leave, Superman befriends Jimmy and let's him take a photo for the paper. I wish I could post the whole scene. Some things that I loved but didn't show. One, Clark remembering his parents telling him they will always be proud of him. Also, the first picture Jimmy takes Superman has his hands over his groin, strikingly similar to a Christopher Reeve promo picture. Jimmy makes him strike the more classic pose of hands on hips. Despite her usual negativism, Lois writes a glowingly positive piece about Superman. Her headline calling Superman the city's new savior is the only one that is upbeat. 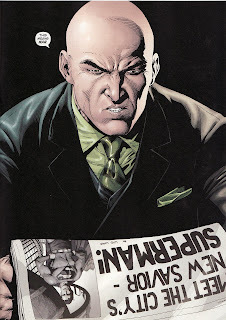 The other papers, all in Luthor's pockets, are playing up the fear angle. The Planet has declared war on Luthor. In case you can't tell, I loved this issue. My only complaint outside of the doughnut was the cover. Lara will always have black hair in my book. And she shouldn't look 30 years younger than Jor-El. But outside of 2 minor stumbles, this book was great. I am interested in seeing just how the city slowly recreates itself with Superman there. 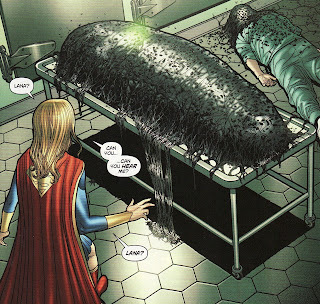 When Supergirl #49 was first solicited and trumpeted the death of Lana Lang, I think it shocked most people. Lana is a pillar of the Superman mythos. She became Supergirl's mentor here on Earth ... a story barely scratched in this title. She couldn't really die, could she? After that initial gasp, I think we all began trying to figure out what the loophole would be. As a group of Supergirl fans, I think we did a good job of figuring this thing out. In this week's brief poll, 20 of 34 voters guessed the Insect Queen angle. And even some of the 'other' votes were versions of the Insect Queen theory. One thing that I have enjoyed about Sterling Gates' run on Supergirl is how he is able to imbue small moments with gravitas. We definitely see that in this issue, especially in the hospital scenes. There are a couple of small editorial things about this issue which I think took a little away from an overall emotionally charged issue. But otherwise, I thought this was another good issue. I have to give myself a little pat on the back. This is what I said back in December 15th when these pages were first previewed on The Source. Lana must be running to catch a cab when her condition finally reaches that critical point and she drops. The shocked look on the doorman has to be followed by a splash page of Lana on the sidewalk hemorrhaging. Okay, so it's not the sidewalk, it's the lobby. Anyways, this is a pretty disturbing image, with Lana covered in blood. I also think, the blood aside, this is a scary and all too real moment - that moment when someone nearby has a sudden medical emergency. What I didn't like was the conversation before she drops where it is clear that Perry White is questioning Lana's love for her job. Of course, Lana has been hiding her condition from everyone so he can't know why she is missing work. But, at least from Lana's side of the conversation, it sounds like Perry is really laying into her and that seemed just a little off. But we already get a little hint of her affliction as we see an insect crawling over the phone. Meanwhile, 'Super-Banshee' remains in battle with the Silver Banshee. I really like Supergirl's internal monologue early on here. It gives us a peek inside so we can understand her feelings better. First off, she says how she is upset that she has been pulled away from Lana to help Inspector Henderson. It let's us know how much she cares about Lana. But the best part is this final part of the monologue. She seems almost matter-of-fact as she talks about how her body has been taken over by the McDougal clan. I can imagine her sighing or rolling her eyes as she says 'I'm Supergirl. This is my life.' Nothing seems easy for her. The clan spirits that have possessed Supergirl are upset with the Silver Banshee and they seem more powerful as a group than Siobhan is as a person. They silence the Silver Banshee with magical chains and berate her for not having found the artifacts before. How could Inspector Henderson find more than she has? There is a great panel where Super-Banshee rips the artifact Siobhan has inside her from her abdomen. It seems the clan will now hide the gathered artifacts again, forcing the Banshee to begin her quest anew. Here is one of those editorial things that bugged me. Why is this red dotted line surrounding this page. I don't think it is an artistic choice. I think it is a misprint. 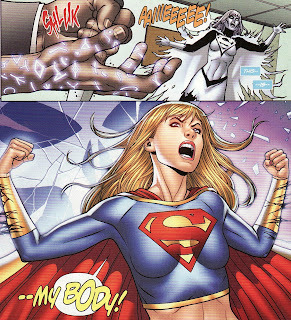 Supergirl has been trying to wrest control of her body from the clan throughout the fight. Henderson realizes that the McDougal spirits are tied to those artifacts. If the artifacts are linked to the clan, they can be used to attack them. He skewers the coin embedded in his hand with the McDougal clan knife. That is enough to let Supergirl break free of Banshee control. It is a nice panel of her literally shrugging off the clan's control. Matt Camp's art is strong in this scene especially Supergirl's facial expressions. 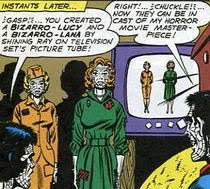 And Silver Banshee then eliminates the disembodied clan spirits by screaming their name. She has dispelled them and now has control of the five artifacts that Henderson has obtained. And then this interesting little nugget. The Silver Banshee owes Henderson a favor. Someday he'll hear her true song. For some reason I love that. What is her true song? Is it lovely? Haunting? Deadly? With that, the Banshee disappears. It isn't exactly a win for Supergirl, but it certainly isn't a loss. What follows is a quiet rooftop moment between Henderson and Supergirl where the Inspector talks about the importance of family, how it should always be first, rank before the job. 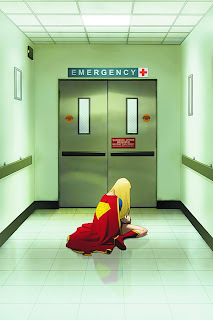 It is ironic as in the midst of that talk, Supergirl hears the doctors discussing Lana's case in the hospital. Kara flies off. Lana is in the midst of being coded by the physicians. Unfortunately the staff is unable to resuscitate her. The code is called and she is pronounced just as Linda Lang comes crashing through the door. I could nitpick about the medicine here (improper placement of defibrillator pads, use of defibrillation in asystole) but I understand the constraints of comics. I talked about powerful small moments in this comic and how much I love them. And, as always, when art and words mesh, I love comics. So it's great that Supergirl is on her knees here, powerless to stop what has happened to Lana. And then I absolutely love how she simply is so overwhelmed by the moment that she tunes out the physician trying to explain things to her. She says it plainly - she doesn't hear anything. Her mind is reeling, too busy trying to grasp the immensity of this moment to listen. The slow fading out of the doctor's words conveys that so much. I have to say personally I have been on both sides of this conversation. That blank defeated look on Linda's face is spot on. In an issue of very good moments, this was my favorite. It hits Linda that she is now truly alone on Earth and sheds a few tears. I usually rant against Supergirl crying but this was totally appropriate and perfect. It again shows the growth of the character over the last couple of years. Early in the title all Supergirl wanted was to be alone. Now she knows the strength of family. But after some time, Linda is able to think straight. What studies did the doctors perform during the code? Did they run blood tests? Most importantly, can Linda see the body? Unfortunately as great as these moments are, I was taken aback by the lack of glasses on Linda Lang. This really stuck out as gaffe for me. We haven't seen Linda that much here but the glasses are a big part of that persona. Otherwise, isn't this just Supergirl in civilian clothes? More importantly, where was the editor reviewing these pages. Would pages of Clark without glasses go unnoticed? No way. This just bothered me. Before Linda can continue her conversation, her hearing picks up noises from the morgue. She rushes to investigate and discovers this ... a chrysalis. That's right, Lana's condition is somehow the result of her time with the Insect Queen! I love it! Does this mean Lana is the new Insect Queen? Is this really Lana or some sort of sleeper clone? Is Lana ... gone? Again, I love the small things in comics - like the hexagonal floor tiles. I wonder if Matt Camp purposefully made the morgue floor look like honeycomb. Overall I liked this issue. 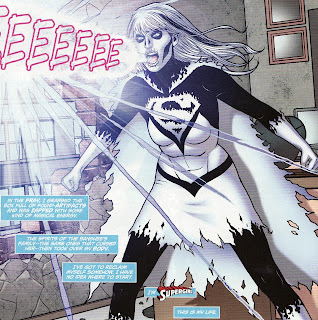 I thought the emotional moments of the second half of the issue were better than the action of the Silver Banshee piece. The dialogue in those 'small moments' was spot on. The Insect Queen reveal was brilliant. Matt Camp's art was really slick. I really hope that DC gives him some more work soon. If only there were glasses on Linda! Sterling Gates and Jamal Igle reunite to tell an epic, oversized battle royale between the Girl of Steel and a mysterious, diabolical new foe! I guess the diabolical new foe is the Insect Queen. Talk about feast or famine. Last week, no super-title came out at all. This week there are 5 books! Supergirl, Superman, World's Finest, Superman Secret Origin, and Justice League: Cry For Justice all came out. 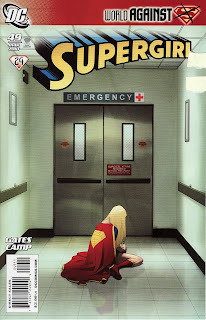 With Supergirl #49 being a bit spoiler-iffic, I figured I would wait a day to review that issue. 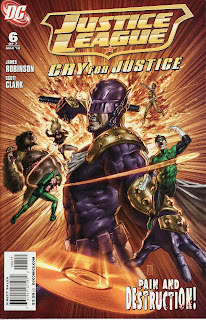 And so, let's start this review heavy week with Justice League:Cry for Justice #6. I can't believe there is only one more issue in this mini-series! It seems like it has been on the DC radar screen for almost 2 years. Delays have dogged this book. Surprisingly, the significant delays haven't been significant enough to allow Mauro Cascioli the time to complete the series. 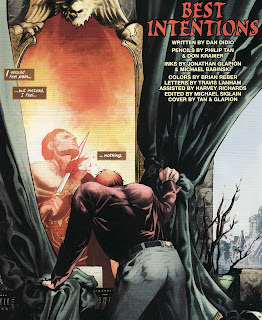 This issue's art is done by Scott Clark. I simply don't know what to say anymore about creators and deadlines. As it was, this book's release was postponed for an inordinate amount of time to allow Cascioli time enough to get on top of the book. And yet, here we are with a guest artist. This storyline takes place before Blackest Night! And that book might finish before this one! Am I being too sour as a fan? Clark's work is nice although not as polished as Cascioli's. In fact, when I read the book the first time, I thought it was still Cascioli ... just rushed. It looks a little rougher than the earlier work on this book. It was only on second look that I saw Clark's name on the cover. From a writing point of view, I thought this was one of the stronger issues of the book. I don't know if that is faint praise. Mostly, I think Robinson did a good job of showing how cunning a foe Prometheus is. Remember last issue ended with Supergirl squaring off against Captain Marvel. 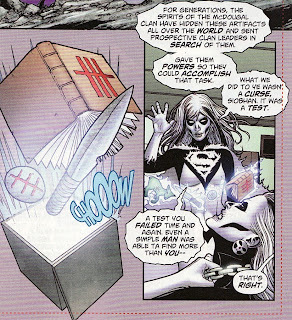 The book opens with Supergirl showing how she figured out who was the real villain here. First off, Supergirl realizes that the 'shield made from magic lightning' Freddy made to deflect Prometheus' Clayface bomb (a power I questioned when it happened) would have fried her if it was truly magical. Secondly, Captain Marvel figured out everything too quickly ... too neatly. And it always seemed to lead the group to one place, the JLA satellite. But most importantly, Supergirl realized that somewhere along the way Freddy said the word 'Shazam' and didn't change. It all adds up to one thing, Freddy is Prometheus. I like that Robinson had Supergirl be the one to figure the whole thing out (albeit a little too late). I also thought that Supergirl falling for someone who turns out to be the villain played off of many similar stories from the Silver Age. At least this time she realized it before the reveal. She even sounds confident as she asks how Prometheus plans to eliminate her. It turns out he is prepared for dealing with a Kryptonian. He has a 'magic bullet', a casing forged from Olympian metals. It might only be a shoulder wound, but it dispatches Supergirl for the rest of the issue. I don't know off the top of my head if Olympian metals alone resonate enough magic to do this. But it shows some advanced planning on Prometheus' part. In fact the next several pages show exactly how prepared Prometheus is as he wades through pretty much every JLA member. It is a decent sequence showing how his computer analyzes the threat and then feeds him the best option. 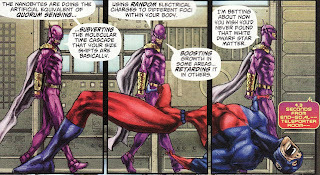 He takes out Zatanna's ability to speak, Plastic Man's ability to control his molecules, etc. And it isn't only having the right weapon for the right hero, it's also having the battle technique. Here I like how he deflected Dr. Light's beam the appropriate angle to eliminate the Guardian. He does something similar to take out Hawkgirl. He takes out Hal Jordan by weakening his will enough to grenade him. He even turns the table on the Atom. When Palmer tries the 'sinus headache' attack, Prometheus' nanobyte defenses turns the table. I thought this was a pretty gripping panel with parts of the Atom shrunk and other expanded. That just looks painful. Hawkman, Starman, Firestorm, Starfire, Green Arrow, Jay Garrick, The Shade ... they all fall. So it is clear that Prometheus is prepared. This really reminded me of the Prometheus we saw in Morrison's JLA, the Prometheus who almost took out the JLA singlehandedly. He didn't do enough to take out Donna Troy though however. He had crucified her to a wall earlier but she has the resolve to pull herself off the wall and go after him. She then viciously batters him, coming close to killing him. I would say this was absolutely gratuitously bloody but this is nothing compared to the Red Arrow maiming panel from last issue. I do like that it is Donna who ultimately defeats him. It would be too easy to have one of the big names be the hero. I always like it when one of the less famous heroes in team books gets some attention. 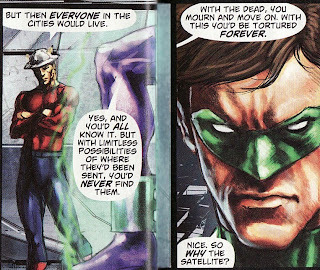 I think it would be less interesting to have someone like Green Lantern save the day. We have seen that so many times already. Shackled to a chair, Prometheus begins to monologue about his plan. Rather than destroy the heroes' home cities, he would teleport the cities into other times, spaces, dimensions. In this way, he did not kill the citizens, merely displaced them. The heroes would be perplexed and devastated that they could never find their people. It is an interesting plan, focusing on the mental weakness of the heroes. But it seemed kind of flat after all the build up over the title. This was his plan? To cause the heroes mental anguish? I know there would be millions of lost people ... but he wants to hurt the heroes feelings? This was his master stroke? Wouldn't it be better to just kill the heroes? I did like that his monologue was only buying him time to have his master stroke actually commence. This panel reminded me a bit of Ozymandias telling Nite Owl that he wouldn't tell his master plan if he hadn't already triggered it. I know ... how could I mention Watchmen in the same sentence as Cry For Justice. With the plan in play, Prometheus starts to bargain for his freedom. He'll turn off the device if the League lets him free. Will the League make a deal with a terrorist? Remember, this was the team that tortured people for information earlier on in the book. Will they simply let him free? 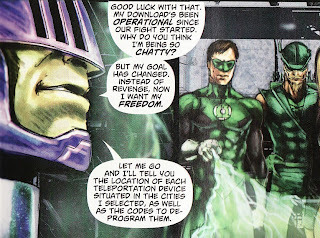 Green Arrow, often the liberal voice of the JLA, demands that they not free him. It will be interesting to see where the political pendulum of this group swings. To prove that his device is active, Star City has started to be teleported away. I like the picture here with skyscrapers being ripped apart. Looks like something from a disaster movie. I think just about everything that can be said about this title has already been said. At times the dialogue is stiff. The art can be beautiful. The action is good but can veer towards the gruesome. The book is late and now had a guest artist. A guest artist in a 7 issue miniseries!? But as a fan of Prometheus, I did enjoy this issue's portrayal of him as he casually walked through the gauntlet of the League. Even if the plan seemed a little off, he did seem cool and calculated here. Lastly, I was hoping that some of the text piece in this issue would be about Supergirl. Instead Robinson talks about Jay Garrick and Batwoman. I think Batwoman appeared in a handful of panels in this book. One more issue in this series which I will have to sift into the DCU timeline. How outrageous will it be? Supergirl #49 comes out tomorrow and we'll finally get an answer as to what is ailing Lana Lang. I have been looking forward to this issue by Sterling Gates and Matt Camp since the solicit. I really am hoping that Lana doesn't actually die here. The Linda/Lana relationship has barely been explored. But what is Lana suffering from? Time to poll the audience. I probably should have done this poll much earlier than the day before the issue is released. As a result of my tardiness, the poll will only be open for 48 hours. Somewhere along the way, Sterling Gates said in an interview that whatever Lana is suffering from is something long term fans would appreciate. So what could it be? It is the simplest answer. But the truth is, we went through the 'Saving Thomas' storyline within the last couple of years, so it seems early to retread that topic. Plus, just last issue, Lana told us it was more of an immune deficiency problem. Certainly, some types of cancers can make you more prone to infection - but that is usually more an issue while enduring chemo. I don't think it's cancer. If long time readers will find the revelation cool, why not make it the 'exotic tropical illness' that the Kents succumbed to in the Silver Age. 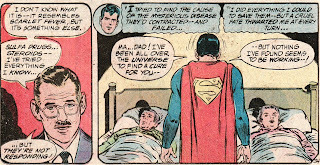 Remember that Superboy couldn't find a cure for this unique illness and as a result the Kent's died. If Argo City is back in continuity, why not the Kents' tropical fever? I would vote for this but I doubt that is where we are going. Lana was the Insect Queen back in the Silver Age as well. A few years back, Kurt Busiek updated that part of the character. In Superman671-3, an extraterrestrial Insect Queen comes to Earth and uses Lana's DNA as a template to create a suitable body for her conquest. It is at least implied that Lana got something out of the deal as she feels 'oddly strong' and is able to take out some insect warriors with her fists. Could this manipulation of her DNA be behind her slow deterioration? I think this is the favored theory. It really could be anything. Radiation poisoning from Kryptonite? Toxic exposure while working at LexCorp? Slowly becoming a Bizarro? Lycanthropy? If you guess 'other' on the poll, I would love to hear your ideas. 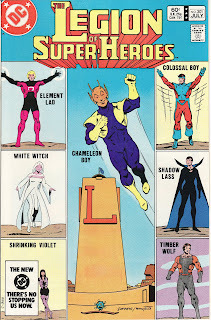 I know I said I would pace myself when it came to reviewing the Supergirl/Brainy moments of the Levitz era Legion of Super-Heroes, but frankly I have been having such a good time rereading these, I figured I could review the next issue sooner than anticipated. 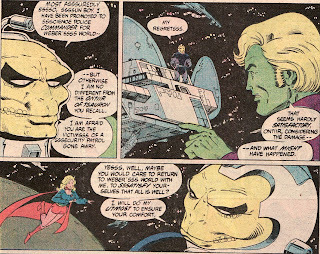 Legion of Super-Heroes #301 continued Supergirl's brief revisit to the 30th century. Kara actually took part in a Legion mission which was led by (no big surprise) Brainiac 5. 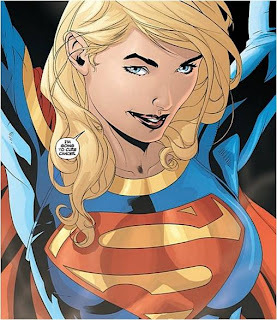 As usual, Paul Levitz does a great job with Supergirl making her strong and confident. 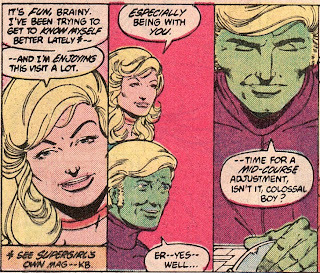 But the fun here is the Supergirl/Brainy relationship ... coy 'are they together or just being flirty' interactions ... that showcase just how uneasy Brainiac 5 is with his emotions. Levitz and Giffen were in such a groove at this point with LSH. The Great Darkness Saga was half a year prior and the creative team was just clicking. In particular, I have always been impressed with how Levitz handled the huge cast of the book. Everyone seemed to have a unique voice; no one was lost or ignored for too long a time. And he not only juggled the 20-plus Legionnaires but also a vast number of supporting characters like Shvaughn Erin, Dr. Gym'll, Proty, RJ Brande, Gigi Cusimano, etc. Giffen had a clear view of the future - a world without windows, with rounded architecture that gave the book a distinct look. This was a great time to be a Legion fan ... maybe the best time? 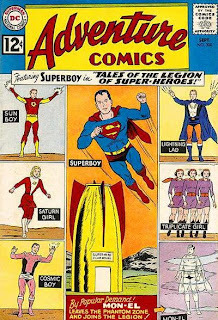 The cover of this issue was an homage cover to Adventure Comics #300. This was just another reminder that the creators here were aware of the Legion's history, acknowledged it, and understood that continuity was a big part of being a Legion fan. The bulk of this issue is dedicated to Chameleon Boy attempting to regain his lost shape-shifting powers on his home world Durla, a trip he makes with his father RJ Brande. Dream Girl, the current Legion leader leaves Earth with the team's heavy hitters (Mon-El, Wildfire, Ultra Boy, Star Boy) to help with the terra-forming the devastated Daxam. When Chameleon Boy's flight ring stops functioning, Brainy forms a team to fly to Durla to investigate. He asks Supergirl to join him on the mission. Supergirl is more than happy to be part of the team especially since it means spending more time with Brainy. I like how Levitz comments on Supergirl's personal journey in her own book. In both Legion and Daring New Adventures of Supergirl, Kara is shown to be pretty confident in her skills and quite mature. Brainy's response is perfect. First he stammers. Then he can't even look her in the eye, focusing on the ship's console and changing the subject. Suddenly, the Legion ship is attacked and destroyed, forcing the Legionnaires out into space and on the attack. 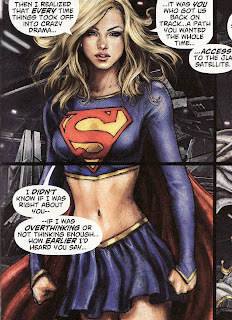 As I mentioned before, I love Giffen's style of Supergirl. First, I love how she always holds the cape in her hands, as seen in the first panel. 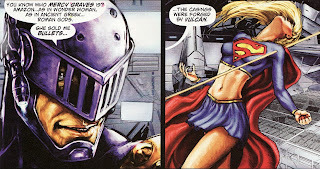 I also like how Giffen has Supergirl using her cape as a shield, holding it out wide and blocking enemy fire. And finally, she pulls no punches, destroying a ship with her heat vision. 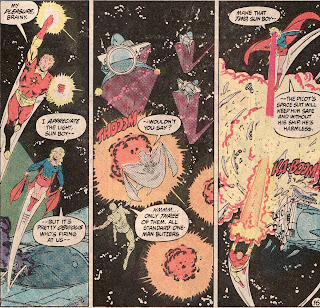 Levitz always showed Supergirl as a powerful hero. 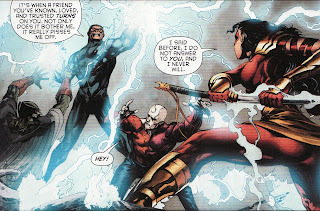 I still love how she manhandled Darkseid in the The Great Darkness Saga. Surprisingly, the attacking ships turn out to be Science Police under the command of Officer Ontiir. He apologizes, saying he was only defending the artificial political world of Weber's World. Just a bit suspicious about the attack, Brainy asks to head to the planet for further evaluation. Ontiir agrees. Hmmm .... I don't know if I trust this Ontiir. Hee hee. Again, the bulk of the issue is about Cham's trials to regain his powers, something which he eventually does. I had to include at least some panels of his final trial, a shape-shifting duel with a high-ranking Durlan. 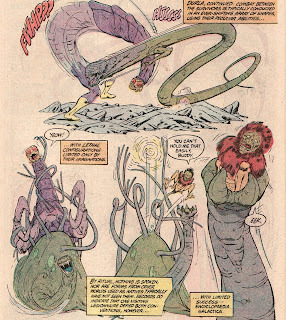 Giffen showed off his imagination here, as several pages of bizarre looking creatures fighting each other leap off the page. I have to say, these issues have stood the test of time. I have enjoyed rereading them and maybe it is nostalgia, I really feel they are of high quality - both story and art. And Supergirl is respected here as well. With a cover trumpeting 'Superman and the Outsiders', rumors of a 'bold new direction' (I am a sucker for such stuff), respect for Philip Tan's art on Green Lantern, and curiosity about Dan Didio's writing ability, I picked up Outsiders #26. I will admit that the potential link to the Superman titles was the big selling point. If not for that I don't think I would have picked up the issue. In fact, I have never really read The Outsiders at all despite the fact that includes a couple of my favorite B-listers: Metamorpho and The Creeper. So this was the chance for DC to grab me. It sort of worked. Now remember that I come into this issue with only passing knowledge of all of these characters. What I know of them is what I have been able to glean from their appearances in other comics like Final Crisis crossovers, etc. 'Bold new directions' should be easily accessible to new readers who shouldn't feel lost. Unfortunately, I felt a bit lost. First off, we meet a clearly unhinged Geo Force. He is dealing with a lot of issues and seems to exhibit a manic/depressive mood with a borderline personality. He seems to polarize his teammates, some who will follow his lead of the team, others questioning his actions. I can understand those questions since it is implied in this panel that Geo Force tried to gore himself with a sword to the neck. But even in this first scene, we see Geo Force talking to Roy. As a new reader I was trying to figure out why Red Arrow/Arsenal was in Markovia. Turns out that this Roy is Owlman. Again, as someone trying this comic for the first time in an issue marketed as a good jumping on point I shouldn't be confused. Maybe those little character boxes we have seen in Legion of Super-Heroes, R.E.B.E.L.S., and in Matt Fraction's Uncanny X-Men would have been helpful here. As confused as I was about Geo Force's overwhelming angst, I was more confused about Katana and her compulsion to kill anyone who stands against her. This is again part of the problem of jumping in. 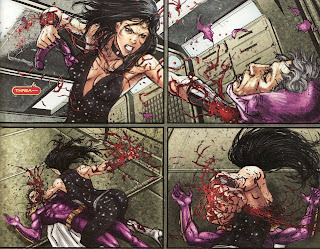 Maybe Katana has always been a killer and I have been misled by my few interactions with her in other comics. 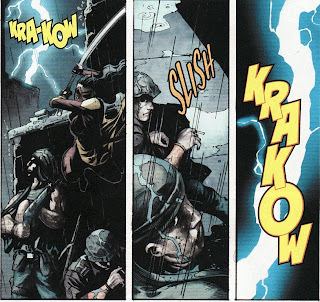 But it seems off, even to Black Lightning who joins her on a mission against coastal pirates. This isn't to say I didn't like this characterization. To be honest, the ruthless Katana was the most compelling character in the book. But I wonder if long-time readers of the book and fans of the character would agree. What is clear is that the team seems to be in disarray with an unstable leader at the top. Katana and Metamorpho seem to agree with what Geo Force is doing. Black Lightning, Owlman, and the Creeper seem unsure. Team dynamics and personality conflicts are important plot points in team books like this. But the big news was the final panel. The Eradicator is back and is now a New Krypton liaison to Markovia. Furthermore, Geo Force has decided to not only upset team dynamics, he also decides to rock the international relations by declaring Markovia as a sanctuary for Kryptonians on Earth (something in direct opposition of the UN declaration). Now my knowledge of the Eradicator unfortunately ends around the time Reign of the Supermen ended. So I don't know much of his career as an Outsider or why he hasn't been around in a while. But this is a tantalizing hook for Superman fans. I do think it was tough to drop into this book and these characters' storylines and histories without much preceding knowledge. I have to say I felt a bit lost in some of the interactions. Philip Tan's art seemed rushed in some places. That said, the Katana battle scene on the boat crackled and were the strongest art pages of the book. But overall, I don't know if this worked for me as a new reader. 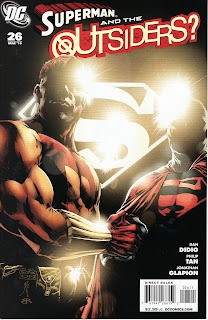 I will probable give the book a couple of more issues because of the link to New Krypton. But if that wasn't here, I don't think this issue sold me enough to keep reading. I always seem to hearken back to Birds of Prey #56 as a great example of a 'bold new direction' issue. First off it says 'bold new direction' right on the cover! 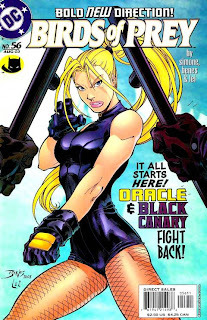 The cover art is attention grabbing ... Black Canary poised in battle. I had only passing knowledge of Black Canary and Oracle before this issue. I had not collected Birds of Prey before this and only knew the characters from appearances in other books. Still, this issue showcased their powers and personalities in a clear way so that I didn't feel like I was lost. It also had a great cliff-hanger that made me come back for more. I collected Birds of Prey for the next 4 years (until Gail Simone left) because of this issue. I have since followed Simone to most everything else she has written. That is what a 'bold new direction' issue should do. Grab you and not let go. You could even point to Supergirl #34 as another good example. That said, I am on board with the Outsiders for a bit. Hopefully things will become a little clearer for this new reader.